My first job, at fifteen, was working at Kentucky Fried Chicken in Huntington Beach. Not very glamorous, but at fifteen, you took what you could get. All of my friends worked there, which was really the only criteria for a first job--well, that and your parents willingness to drive you there. The uniforms were dark brown with orange and beige stripes...very Urban Outfitters. The man who owned it was a WWII veteran named Bill who sported a neat flattop, high and tight. He drove an old, very old, burgundy Cadillac and looked a little like W.C Fields in polyester pants and a bolotie. I can just see him now, all in brown, hunched over a large white plastic container, elbow-deep in macaroni salad, mixing it with his ginormous hands. Armed with our Mapquest map, Larry and I drove across Orange County to a small restaurant on top of a hill to attend a benefit dinner. We were late, way late, and I hate being late. I pride myself on being on time, so much so, that if I am on time, in my mind, I'm late. I usually like to go to these charity events. I like getting dressed up, eating a nice dinner, meeting new people, all in the name of helping, in this case, "the kids." This night was different. As soon as we arrived and were seated I knew it was going to be challenging evening for me. The room seemed serious and sober. The lighting, far too dim to critique what the other women were wearing. The mood, far too solemn to have a good laugh. As Larry goes off to get me a glass of wine, I eye the fellow do-gooders at my table to find the one that has "I don't take myself too seriously," written on her face. Hummm, not seeing anyone here.... starting to panic a little... "Where is Larry with my drink?" At these functions I sometimes feel only half grown up. Part of me says, "Yes, it is totally appropriate that I am here." The other half has the urge to help clear the table and follow the wait staff through the kitchen door, out to the back alley where we would sit on empty vegetable crates and have a cigarette. When he returns, I lean over and ask him if he feels that way sometimes. "No," he assures me, "I pretty much feel like at grown up." Drats, it’s just me. As I take a drink of wine, I peer over the rim and look, once more, at the woman seated next to me. I usually can find something to talk to anyone about, but she was a tough nut to crack. Our brief discussion of her medical condition and then her drive to the event left me searching for the kitchen door. Then I asked her the question that changed the course of the night, "Do you have any animals?" Without looking up from her goat cheese salad, very matter-of-factly, as if it were the most normal thing in the world, she said, "I have twelve cats." Twelve Cats!!! An obligatory conversation gold mine! This could fill up hours....."What are their names?" 15 minutes-- gone by. "Do they all get along?" 20 minutes-- pass in a flash. "Don't you think most people don't understand cats?" impassioned 10 minutes-- spent. Before I know it, they are serving the main course. And luckily for me, her kind and caring nature was topped only by her ability to know when to stop talking, turn away, and eat her prime rib. We chatted now and then and I really ended up liking her very much. I am not sure when it all began, but for some reason lyrics to songs run wildly through my head, all the time, everyday. Usually preceding my own thought in a situation. For instance, when someone says something to me that is rude or judgmental, I THINK, "Frankly, Mr. Shankly" (The Smiths) and then say whatever comeback I can think of after that. So it goes. All day. Everyday. This really isn't bad. I'm sure everyone has her own little dialogues with herself. Inside jokes, really inside--just between you and yourself. Then the summer of '95 it all went tragically wrong for me. This internal record was scratched and skipped, repeating the same phrase endlessly. Every quiet moment in my brain, every silent respite from the noise of The City it would come....."You put the boom boom into my heart." 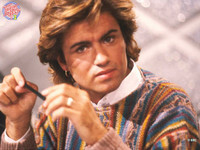 (George Michael, well, Wham! really.) Sometimes the begining of "Wake me up before you Go-Go" that goes like this, "Jitterbug. Jitterbug", but usually it was just "You put the boom boom into my heart. You send my soul sky high when your lovin' starts." Truly some of the most inane lyrics ever written. Oh, nooo... "You put the boom boom into my heart," night and day. I decided to face the problem head-on. Cleverly, I figured, the only way to get George out was to get someone else in. But who? Who could stand up to "You put the boom boom into my heart?" Let me take this opportunity to apologize to everyone who knew, lived with or dated me during that summer, because when I say "repeateded listen to" this artist: I mean Rainman-style. Let me give you a lyric geek hint "Jodi wears a hat although it hasn't rained for six days." That’s right, Lloyd Cole. Turtleneck wearing, solemn-faced, self-pitying Lloyd. Now, I am possitvie in a true fight, fist-to-fist, George could send Lloyd running, eyes swimming in tears, to the nearest pub or tearoom, or where ever English men go to cry. But in this arena, with repetitive play, I thought Lloyd might just take him. It was the singing of "Looking like a born again. Living like a heretic. Listening to Arthur Lee records. Making all your friends feel so guilty, about their cynicism. And the rest of their generation. Not even the government are gonna stop you now "(Actual lryic to Lloyd Cole song) against "You put the boom boom into my heart." And darn it, if I was going to let Mr. Shakey Bottoms win.